Follow the green-and-white pilot wheel markers along the Great River Road in the heart of eastern Arkansas's Mississippi River Delta country. The road, designated a national scenic byway, will lead you from north to south through this rich agricultural kingdom where cotton, rice, soybeans and wheat flourish in some of Arkansas's richest soils. Crowley's Ridge Parkway, another nation scenic byway, also winds through this region, providing excellent views of the productive land from atop a geologic oddity rising from the Delta. Learn more about Crowley's Ridge. This is the land where Europeans first crossed the Mississippi in 1541, where you can experience a taste of the civilizations they found here at the Hampson Museum State Park at Wilson and at Parkin Archeological State Park at Parkin. You can relive the early days of more recent settlement at countless museums throughout the region, including the Arkansas State University Museum at Jonesboro and the Museum of the Arkansas Grand Prairie at Stuttgart. 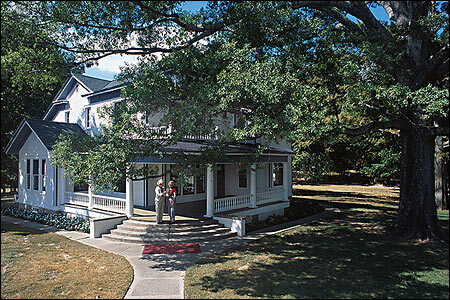 Highpoints include the Hemingway-Pfeiffer Museum & Education Center at Piggott, where "papa" penned portions of "A Farewell to Arms"; the historic riverport of Helena, where the Delta Cultural Center interprets the land, the people and the music of the river country; Arkansas Post National Memorial, which preserves the site of the earliest settlement in the lower Mississippi River Valley; Southland Greyhound Park, one of the largest dog tracks in the country; and Lake Chicot State Park, where fishing is exceptional and bird watching second to none. And don't miss the Louisiana Purchase State Park, where a monument marks the initial point for surveys of the 1803 Louisiana Purchase. Special bicentennial celebrations across the state are planned for 2003. Learn more at www.LaPurchase.org.